Chat (or chaat) masala is a very popular spice blend in northern India where it is often tossed with fruit or chickpeas to make simple "chat" snacks sold by street vendors. While there are dozens if not hundreds of recipes for chat masala, dried mango or amchoor powder and black salt are essential ingredients — these are combined with various seeds and spices to create a wonderfully hot, sour and salty mixture that is absolutely delicious with cool or tangy foods. Chat masala is a favorite of mine when sprinkled on fresh tomatoes or hard-boiled eggs, or incorporated into summer salad dressings. If you haven't tried chat masala already, you will be in for a treat. Good pre-blended and packaged chat masalas are always available in Indian grocers, but making your own is always a preferred option for freshness and for experimenting with flavors — besides which, it only takes minutes to prepare a batch that will keep for months. This recipe comes from Yamuna Devi's indispensible treasury of authentic Indian cooking, Lord Krishna's Cuisine . Mango powder, black salt — also known as rock salt — garam masala and asafetida are also available at Indian grocers. Dry roast the cumin and fennel seeds in a small frying pan over low heat for about 5 minutes or until the cumin seeds darken a few shades. Toss in the asafoetida and stir in for a few moments. Remove from heat and grind in an electric coffee grinder until powdered. Add the remaining ingredients and pulse to mix. Store in an airtight jar away from heat and light for up to 2 months. I am very impressed with this post- I have yet to try making my own chaat masala. Very nice, Lisa. 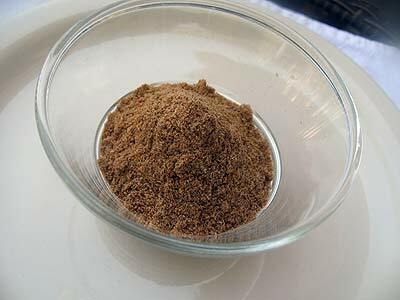 I was just looking for chaat masala recipes but the one I found called for tamarind powder which I don't think I've seen (maybe I just haven't looked hard enough)... so this recipe looks great! Do you know anything about tamarind powder? Btw, the recipe was from 1000 Indian Recipes which I just bought based on your high praise! Hi Janet. You can probably find tamarind powder at an Indian grocery store. You could probably adjust the recipe and use tamarind pulp instead. Though my kitchen is overflowing with spices, I don't have tamarind powder. It is made from cleaned tamarind fruit that is deseeded. Then the pulp is shredded and dried. I gather it is popular because it is ready to use. To the person looking for Tamarind powder: Just about every Mexican market (ubiquitous if you live in the American southwest, Texas to California) sells a Tamarind drink powder (sweetened but most recipes calling for Tamarind also call for honey or sugar so you can just adjust accordingly) I find it works well as a substitute for either the powder or the paste.